A big thanks to Hugh Jackman and the release of Reel Steel. 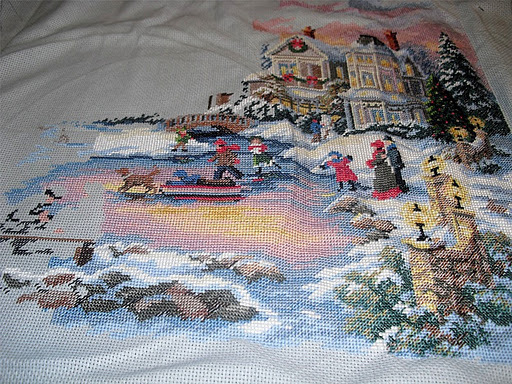 Because of it (and my lack of desire to see it), Mike was busy watching the movie and I rocked the cross-stitching scene! Woot! I think I can officially say that I’ve hit the halfway point. And that’s it for this week! Let’s just hope Mike finds another movie to watch so I can make some more progress, LOL! What are you going to use this for when it's done? Any ideas? If you want to frame it and set up a shrine, let me know (so I can worship its loveliness with you… and also tell you of the nifty technique I know for safely stretching cross stitches over foam core board). And yeah, there are some houses and a ton of trees in the background. Then there is adding all of the little details. And you are welcome! I think it's a cute story–and perfect for your monthly short!